After the agave nectar scandal, nothing seems to be big enough to post about. At it seems odd, that I am coming here to review a commercial and mass produced product. But hey- I do admit, that I love coke and really like some other commercial sodas. I only try to stay away of artificial ingredients. This said, Fanta Pineapple doesn't start a nice relationship with me. All this theory besides, how is the soda? slight bubble gum pineapple aroma - tropical character with a funny hint of coconut at the end of the impression. Sweet upfront, with a definitive tropical pineapple aromatic kicking in. Nice acidity as well. It taste definitely better than pineapple juice from concentrate! Sweetness is quite lingering. Tropical flavors are moving towards coconut / nuttiness when the overall impression starts to fade. Surprisingly tasty pineapple beverage, which cannot though renege its industrial origins. Yes - overall it is nice. Nothing to write home about, though overall pleasant. Obviously it would not be able to compete a homemade pineapple soda at all. But rather than using 7up or Sprite [which definitely are as natural as this soda], it is worth to think about this product, when you are mixing up your rum [or gin - and if it is really necessary: vodka]. It would be adequate at home, but I wouldn't offer it in a bar. Thanks for the comment - and thanks for the link. Glad, that you find my blog informative. 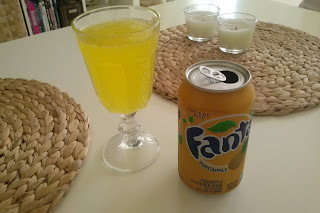 I just tried Fanta Pineapple (in the U.S.), and in addition to all the characteristics you describe, I found a bitter aftertaste. I was thinking it may be due to an artificial sweetener mixed in, but there doesn't seem to be one among the ingredients. What do you think may have caused the bitterness? I haven't really noticed any bitterness at all in the can I tried. Rather than artificial sweeteners, I would rather suspect the enzymes in the pineapple, which is notoriously aggressive and interact with a lot of stuff [that is why you can't make pineapple jell'o out of fresh pineapple, as the enzymes are preventing the gelatin to solidify].